The AC number is used for ordering the Emulation Extension Pak, which contains the emulation header. However, this number is not on the header, as the board may be used for multiple headers by inserting different -ME2 devices. To identify this header, use the following information. For this header, you will need to select your device type using JP2. especially when Vdd is greater than 3.6 V (with respect to Vss). You can also enable the Power LED by using JP1. J7-J9 are not jumpers but a group of pins that you can use for trigger in and/or trigger out signals. Note 1: Do not change this setting when the header is powered. Power down first. Note 2: See Trigger In/Out. See the “Limitations” section in your debug tool online Help file for details. 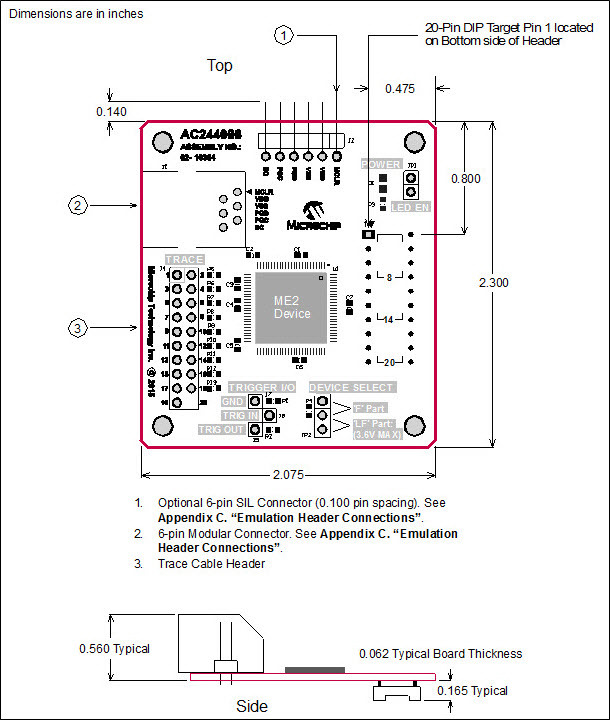 The figure below lists the dimensions for the emulation header. Dimensions are design values in inches. If the length and/or width of the emulation header is too large a footprint for the target board, consider using stand-offs, single in-line pins, transition sockets or other extenders in the header connection socket to raise the header above the target.